Whenever possible I like to try wines from regions with which I am not familiar. When it comes to Portugal, we all know Port, the wine they are known for, but Portugal has been producing wines for over 4000 years. Evidence of wine making has been found there starting around 2000 B.C. by the Phoenicians. Vines continued to be cultivated there by the Romans until the spread of Christianity, which incorporated wine in the communion ceremony, and it’s been thriving ever since. There is a robust wine industry in Portugal producing superb wines that most of us have never tried; something like 90% of the wine produced there is drunk there! So I did not know what to expect when I found Colossal, a red blend from Portugal, named a “Smart Buy” by Wine Spectator, which also rated it 91 points. After trying it myself, I can say without reservation, the Portuguese know what they’re doing. What a buy! Loads of dark fruit, boysenberry and black cherry, with a touch of raisin and a smoky/peppery finish. 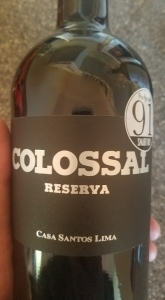 Colossal is 30/30/30 split of Touriga Nacional, a native grape of Portugal, Syrah and Tinta Roriz (aka Tempranillo). You can pick up a bottle for less than $12, and often less. If you’re looking for a delicious, inexpensive vino, give Portugal a try. Colossal definitely fits the bill! 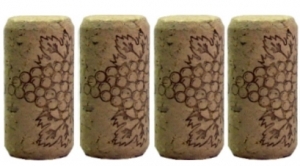 On my five-cork scale based on taste and value, the Colossal Reserva red blend from Casa Santos Lima gets four corks! It’s a tremendous value. If you’d like to try interesting wines like this, please join me at our next private wine party at The Party Source! I host a wine dinner the last Wednesday of the month with sommelier Steve Tartaglia, and we feature several interesting wines, paired with a delicious catered dinner from Kate’s Catering and Personal Chef Services. There are always cool prizes to win, too, so listen Wednesday at 4:15 to win your spot on the guest list, or click here for a chance to win!